No making charges on certified diamond jewellery at all TBZ-The Original stores in Andhra Pradesh and Kerala from 5th July to 20th July 2013. This monsoon season, get some fabulous offers from Tribhovandas Bhimji Zaveri Limited a well-known and trusted jewellery retailer in India with a legacy of over 148 years. 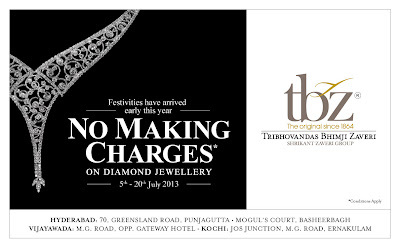 TBZ-The Original has waived off all making charges and the offer is valid from 5th July 2013 to 20th july 2013, in TBZ stores, in Andhra Pradesh and Kerala on all their certified diamond jewellery collections. According to Mr. Kiran Dixit, Group Head-Marketing, TBZ Ltd., this is our signature campaign, that customer's favorite too. It is observed that first time diamond buyers or diamond jewellery collectors or wedding buyers, queue up to the TBZ Stores during this campaign. Some customers take this opportunity to prepare themselves for the upcoming festive season. Whatever may be the buying purpose, TBZ’s wide range of diamond jewellery designs will cater to all.